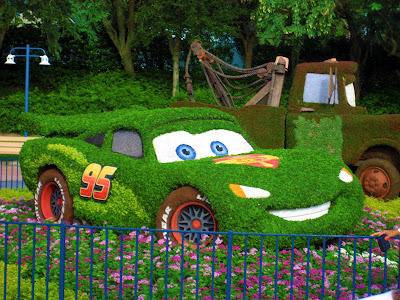 Cars Really Can Go Green! When Disney's Hollywood Studios opened on May 1st, 1989 (the third one to open of Walt Disney World's four theme parks), Michael Eisner was really saying: 'Welcome to the theme park that Disney slapped together the minute Universal Studios announced plans for a park in Florida,' lol. 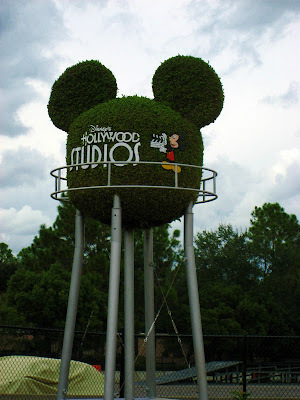 They did beat out Universal which opened in 1990, but the then "Disney MGM Studios" (name changed in 2001) was sorely lacking in attractions (only FOUR!) and was far from a full day park, so in this case, it didn't start with a Mouse but with a rival studio opening a theme park just a few miles from Mickey's door. 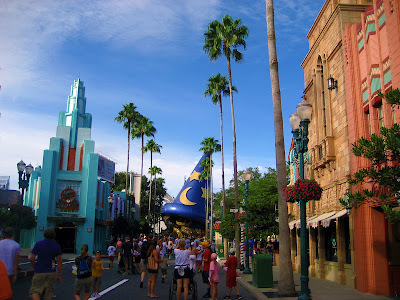 Disney's Hollywood Studios has nearly doubled in size in the last 10 years and continues to expand. Today, the park spans 135 acres, themed to show business, drawing inspiration from the heyday of Hollywood in the 1930s and 1940s, where guests can witness the inner workings of living, breathing movie and television production facilities through behind-the-scenes glimpses of Hollywood-style live action shows, thrilling attractions, hands-on participation, backstage tours and special events that only happen in this Disney Park dedicated to entertainment. In 2010, the park hosted approximately 9.6 million guests, ranking it the fifth-most visited amusement park in the United States, and eighth-most visited in the world! 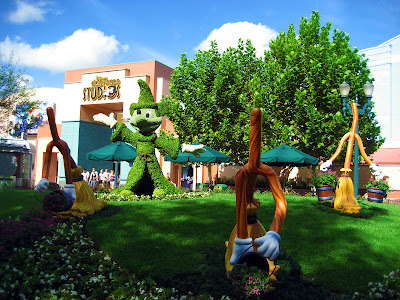 The park consists of four themed areas, and unlike the other Walt Disney World parks, it does not have a defined layout; it is more a mass of streets and buildings that blend into each other, much like a real, bustling motion picture studio. Originally, however, the layout of the park did have an interesting design characteristic with the plaza at the end of Hollywood Boulevard featuring a large Hidden Mickey, visible in aerial photographs and early guide maps, but construction and other changes have eliminated much of this image. I arrived just as the park was opening at 9am, paid the whopping parking fee of $14, had my prepaid admission pass scanned at the ticket turnstiles, received a park map, and entered Hollywood Boulevard, which serves as the park's main entrance, where reality blends into fantasy, with neon and chrome, art deco and modern architecture dominating the scenery. 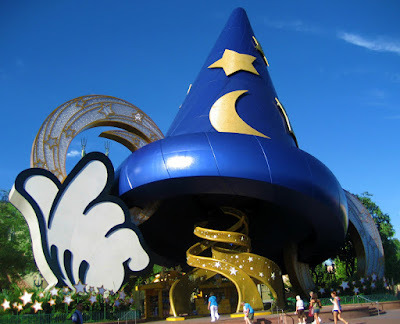 As soon as you walk down the street you'll see the unmistakable 122-ft tall Sorcerer's Hat from Fantasia in front of you, the icon of Disney's Hollywood Studios, and behind it is a replica of Grauman's Chinese Theater, complete with the hand-prints of numerous celebrities in the cement (just like the real thing in Hollywood, CA), including Robin Williams, Samuel L. Jackson, Sylvester Stallone, and Billy Joel. To enhance the old-time atmosphere, you'll see Citizens of Hollywood - characters like 1930s detectives, starlets and gossip columnists, populating the streets and interacting with the crowds they draw. Colorful shops (selling Disney souvenirs of course, lol) and restaurants reinforce the feeling of yesteryear -- the Hollywood Brown Derby, for example, faithfully recalls the landmark meeting place of the stars, right down to its signature Cobb salad and grapefruit cake. Parades such as the Pixar Block Party Bash travel down Hollywood Boulevard on their route through the park, and live street entertainment can be found here throughout the day. I continued to the Echo Lake area, distinguished by a small oval-shaped lagoon, and passed by the Star Wars: Jedi Training Academy (kids learn to "use the force" with a 30-minute live show of light-saber duels with Darth Vader and other characters) onto the NEW Star Tours attraction, a 5-minute, 40-seat, flight simulated ride that combines motion with an action-packed 3-D video to send passengers with droid pilots C-3PO and R2-D2 on a space flight which unexpectedly changes from a run-of-the-mill sightseeing trip to a perilous mission to protect a Rebel spy from the Galactic Empire. 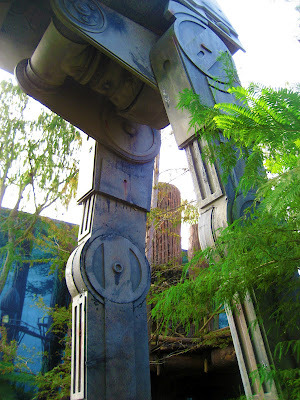 Designed by teams from both Walt Disney Imagineering and George Lucas' Industrial Light and Magic (ILM), it's awesome! Pixar Place, the park's newest section and former home of Luxo Jr. (the six-foot-tall audio-animatronic version of Pixar's desk-lamp mascot), resembles the Emeryville, California campus of Pixar Animation Studios, and includes many of the original sound-stages used once upon a time when the park hosted actual production facilities, along with Green Army Men, Buzz and Woody appearing intermittently throughout the day. 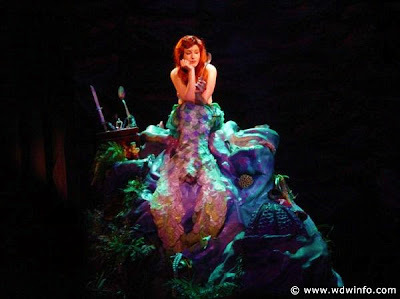 Here, I experienced Voyage of the Little Mermaid (I'm 29 years old, lol), a 17-minute live musical theater show that uses glow-in-the-dark puppets, lasers, music, film projectors, human actors and water effects to re-create favorite scenes and Academy Award-winning songs from the acclaimed animated film, such as "Under the Sea," "Part of Your World" and "Poor Unfortunate Souls," the latter of which is sung by an enormous 12' high by 10' wide Ursula puppet. It was better than I had expected; I even got lightly sprayed with "sea mist," hee hee. 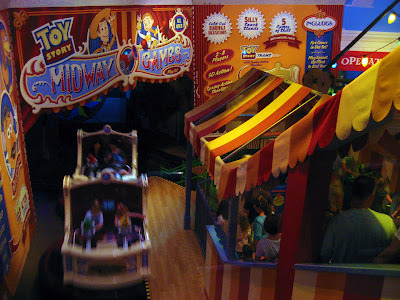 Then I hopped onto Toy Story Midway Mania!, one of the most popular attractions at the park; an 8-minute interactive 3-D ride through a gallery of classic midway-style games, hosted by characters from the Toy Story film series. Players use spring-action shooters to take aim at 3-D animated targets and score points which are displayed on the player's screen, and a virtual stuffed animal "prize" is awarded at the end of the ride. Even before getting onto the ride, just entering the queue area alone was more fun as a barrel of monkeys, like walking into a child's retro toy box, adorned with super-sized nostalgic board games and playthings, including a large, sophisticated audio-animatronic Mr. Potato Head stands at the end of the main queue room and interact with guests, following them with his eyes, telling corny jokes, singing, and picking out people in the crowd for special attention. 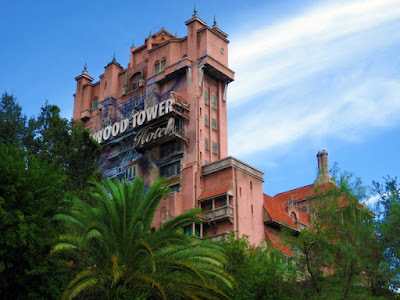 I hustled over to Sunset Boulevard, a section of the park with two outdoor amphitheaters, specialized shops with gifts themed to classic films and Disney characters, the Rock'n'Roller Coaster, and, most notable, the menacingly looming Hollywood Tower Hotel. With a large grin and Fastpass in hand, I excitedly entered the Single Rider Lane (another important factor for shorter wait times) for Rock 'n' Roller Coaster Starring Aerosmith, one of Disney's more exhilarating rides. As I winded my way through the queue, I entered the offices and recording studios of record label G-Force Records (a 68,131 sq-ft building), whose lobby is decorated with posters of real acts signed to labels owned by The Walt Disney Company. 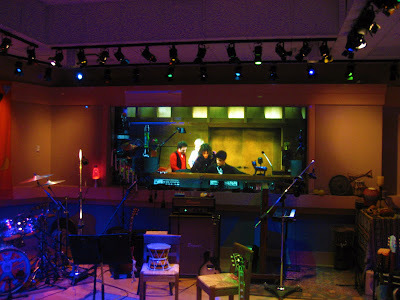 Next I was shuffled into a room modeled after a recording studio, where the five members of Aerosmith are shown finishing a recording session. "Prepare to Shake, Rattle and Roll!" Upon being led into the parking garage to board the ride to the concert, I hopped into a 24-seat "stretch limo" (front seat!) furnished with a 125 speaker, 24 sub-woofer, 32,000 watt on-board audio system, before careening through the winding, neon-filled streets of Tinseltown. The indoor dark roller coaster has a high-speed launch of 0 to 60 mph in 2.8 seconds (the second-fastest attraction at WDW behind Test Track), loops and three inversions on a 3,400-ft track (4.5g as they enter the first inversion - the force of a supersonic F-14, that's more than an astronaut does on a space shuttle launch! ), amplified by the driving beat of a special soundtrack recorded by the rock legends themselves - all firsts for a Walt Disney World attraction. The attraction ended when the limo arrived at Aerosmith's concert backstage, letting me off onto a red carpet. It was an awesome ride, and while considered "extreme," the coaster has been described by enthusiasts as being smoother and less uncomfortable than similar extreme roller coasters, which I have to agree with it. TWO THUMBS WAY UP! 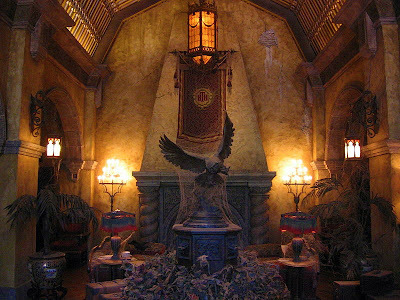 Next I moseyed on over to the nearby Twilight Zone Tower of Terror, based on the classic television series; hands down one of the best attractions at WDW, where terror lurks within the crumbling walls of the once-glamorous Hollywood Tower Hotel, and guests experience the mysteries of what happened one fateful, stormy night. The queue, where typical 1930's music is heard, eventually leads to the dusty, dimly-lit lobby, decorated with a table set with tea and stale pastries, several suitcases left at the check-in, a glowing fireplace, an un-finished game of Scrabble at a table accompanied by half-drunk cocktails, exotic antiques and articles, a television, a cobwebbed owl sculpture surrounded by a circle of dead flowers that appears to be the centerpiece of the room, and plenty of Twilight Zone memorabilia. Everything in the hotel has apparently been left undisturbed ever since it closed decades ago. Through the window, guests can observe that there is a thunderstorm going on outside. Behind the front desk is an elevator with "Out of Order" sign. The bellhop asks the guests to wait in the library while their rooms are finished being prepared. 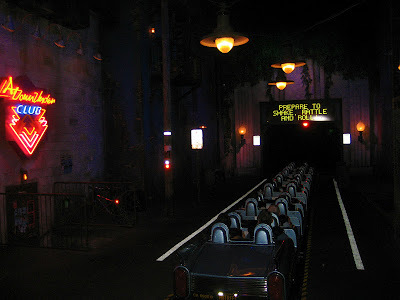 The lights go out, and the television comes on, apparently of its own accord, and gives the back-story to the ride, then guests are instructed to board the maintenance service elevator in the basement boiler room, where, in complete darkness, they are plunged 13 stories into the thrilling recesses of The Twilight Zone. FRIGHTENING! I entered inside the recreation of the famous Hollywood landmark Grauman's Chinese Theatre for The Great Movie Ride, down a queue winding through the lobby past glass display cases containing genuine costumes, props, and set pieces from various films, into a small pre-show theatre where I viewed a series of condensed film trailers for the various films that are featured on the ride, before being led into a cavernous 1930s era Hollywood sound-stage where I was loaded onto the long tram car. The young, energetic ride host took us on a 22-minute, slow-moving journey paying homage to some of the most memorable moments of classic films ever captured on the silver screen, including Casablanca, Alien, The Wizard of Oz and Raiders of the Lost Ark, through realistic recreations, film clips, special effects and approximately 50 lifelike Audio-Animatronic replicas of legendary movie stars to bring it to life. Merely Facades Constructed of Fiberglass and Styrofoam! 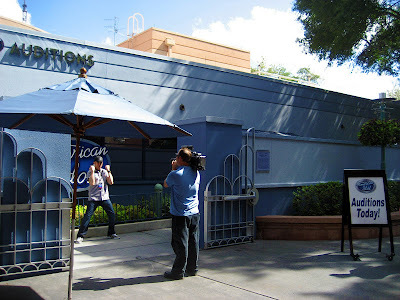 I entered the Streets of America section of the park, originally the New York Street backlot set that was part of the park's original Backlot Studio Tour; the section is now open to pedestrian traffic. 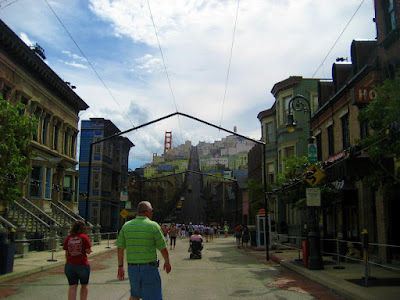 More recently, additional architectural treatments were added to create street sets resembling San Francisco, all done using very impressive forced perspective techniques. After lunch al fresco at Pizza Planet, I experienced Muppet*Vision 3-D, featuring special effects and Jim Henson's The Muppets. Prior to the show, I entered the "Muppet Labs," a large room filled with Muppet "props" and humorously-labeled boxes, featuring a 12-minute video on three overhead television monitors with typical Muppet musical mayhem, serving as the pre-show. Then I took a pair of "3-D safety goggles" and took a seat in the plushly appointed 584-seat theater (modeled after the one depicted on The Muppet Show), where Waldorf and Statler sit heckling from the balcony. Modeled After the Theater in The Muppet Show! The basic premise of the next 13 minutes is that the Muppets are putting on a variety show starring the multi-talented Miss Piggy. Kermit tries to make the cast and crew happy, but mishaps get in the way as Dr. Bunsen and Beaker begin a demonstration with disastrous results as they release Waldo C. Graphic, the world's first computer-generated Muppet. 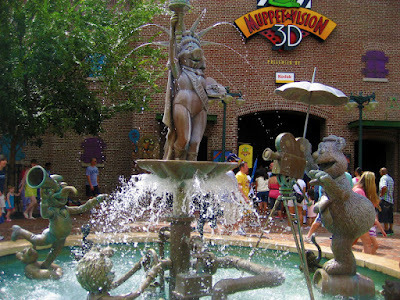 Aside from the Muppets on-screen, there are a number of in-theater Muppets that interact with the show, as well as special effects bringing you into the action, such as real soap bubbles blowing from the ceiling. 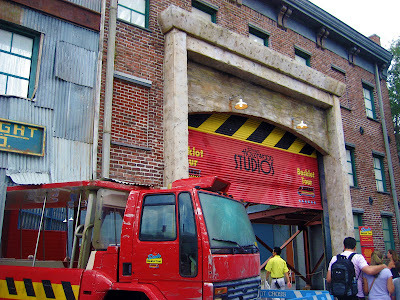 Next I embarked on the 35-minute Studio Backlot Tour, a behind-the-scenes guided walk and tram ride that offers insight into how some of the most spectacular special effects in movies are made. It began with a short walk to a special outdoor viewing area with a large water tank in front of it, with recreations of a battleship deck and engine control room, reminiscent of the movie Pearl Harbor. With the use of pyrotechnics and audience participants, we were treated to a special effects demonstration to discover how battles and storms at sea are created, which included underwater explosions, and simulated torpedo bursts and fireballs. When filming of the demo was finished, the footage was put together with previously recorded footage of airplane attacks and dialogue, and shown to us. 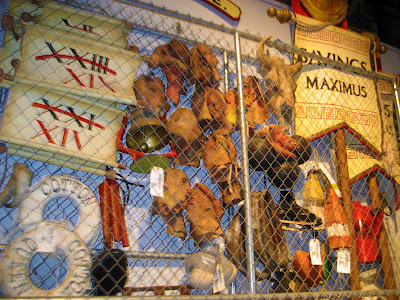 Afterwards, we winded our way through aisles of a prop warehouse with familiar items from feature films such as The Santa Clause, Honey, I Shrunk the Kids, and The Chronicles of Narnia. 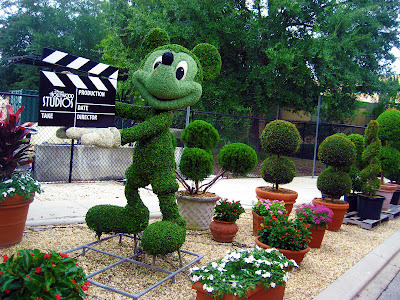 At the exit of the building we boarded an open-air, 200-seat tram that led us on a tour of the backlot, where lifelike sets seen in familiar television shows and movies mingle with delightful topiaries, production bungalows and vehicles used in Disney movies. After the tram drives through a tunnel with windows into the impressive costume and materials building (2.5 million garments, making its wardrobe the largest working wardrobe in the world, with the help of more than 100 designers! 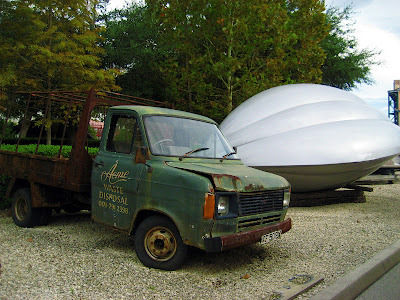 ), it brings guests through an outdoor "boneyard" of vehicles that have been featured in many films, like the escape pod from The Hitchhiker's Guide to the Galaxy, cars used in the Herbie the Love Bug films, bone cages from Pirates of the Caribbean, and vehicles from Indiana Jones. 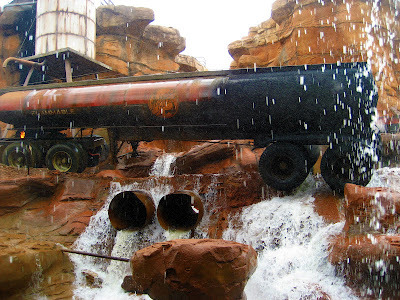 Then guests taken on "a detour" through a "current movie set" dubbed Catastrophe Canyon, a rocky area with a fuel truck and water tanks, where we witness an earthquake, a flash flood, crashes and fire explosions, shaking the tram and possibly getting the closest guests a little wet. We're told how it was done as the tram goes around behind the set, exposing the back of it. The tour is wrapped up after passing the private airplane Walt Disney owned, and exits through a museum exhibit based on AFI's 50 Greatest Villains, showcasing life-sized figures like Darth Vader and Davy Jones in full costume with props. The Walt Disney: One Man's Dream attraction, specifically created to commemorate the 100th anniversary of Walt Disney's birth, is an interactive, multimedia gallery that allowed me to take a self-guided tour through exhibits of photographs, audio interviews, and 400 rare artifacts of memorabilia from the Disney archives that have never been available before, that tell the story of the legendary man who in 43 years won 48 Academy Awards and 7 Emmys, whose life accomplishments still intrigue and inspire people the world over. A trip through time that starts with his birth in 1901 in Chicago, Illinois and continues through his inventions, innovations and company's vision for the future. 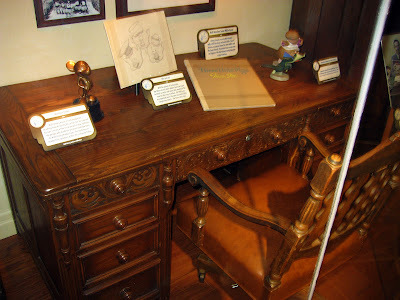 In addition, the attraction includes a short biographical film narrated by Julie Andrews, that explores the extraordinary hardships Walt overcame, as well as previously unseen footage like Walt talking about his creation, Mickey Mouse. I made my way through the sea of people making their way into a 177,000-square-foot facility, and found a seat on the stadium-style bleachers (that can hold 5,000 people) that overlooked the set of a Mediterranean village, for the 33-minute Lights, Motors, Action! 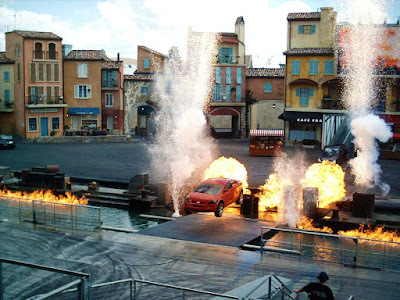 Extreme Stunt Show, which centers around the filming of a spy thriller, with production crew members, stunt managers and a director and assistant director on the "live" set. Using a Tinseltown trick known as shooting "out-of-sequence," the director sets up the different stunts, and the cast of more than 50 people thrills the audience with high-flying, gravity-defying automobile, motorcycle and high-speed watercraft stunts, with more than 40 vehicles (including those in the maintenance garage) that are customized and modified, and piloted by a group of professional stunt drivers. 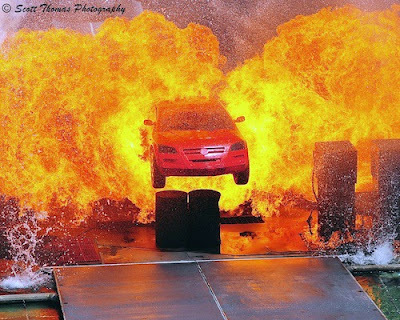 The show includes high-speed spins, two-wheeled driving, jumps, pyrotechnic explosions, high falls and plenty of surprises created just as they are performed for the silver screen. 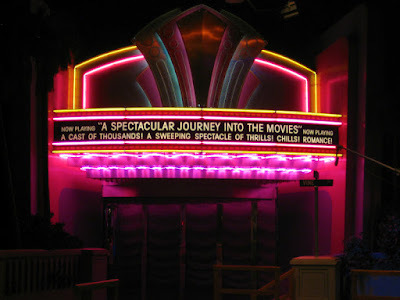 Segments of this energetic attraction are taped and shown on over-sized screens, highlighting how the different camera angles enhance the special effects. After each scene is "filmed," the director then combines the shots to create the completed scene that is played for the audience. Film-making secrets are revealed as you learn how Hollywood creates the memorable chase scenes that leave you on the edge of your seat. IT WAS AWESOME! Then I hurried to catch the last showing of the Indiana Jones Epic Stunt Spectacular! 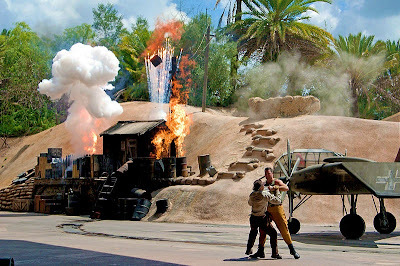 (stopping for ice cream on the way, lol), a 30-minute live show that recreates memorable scenes from Raiders of the Lost Ark, and reveals the secrets behind the stunts and special effects. After the "Casting Director" steps on stage and selects volunteers from the audience and "auditions" them to appear as extras, the show opens against a temple ruins backdrop, where the Indiana Jones look-alike makes his grand entrance and escapes a 12-foot tall rolling boulder chasing him down a narrow path. He is seemingly crushed by the boulder, only to reappear moments later as the set is being deconstructed, and the director explains to the audience what's going on. 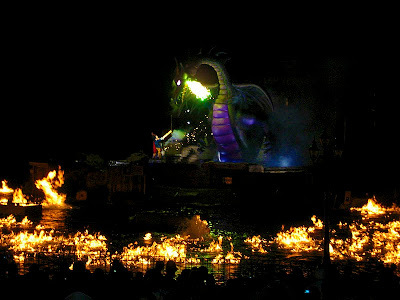 The extras are part of the following Cairo street scene and, after a series of explosions and realistic swashbuckling fight scenes, the show concludes with even larger and louder explosions and pyrotechnics whose heat can be felt even in the audience. The show was kind of cheesy for me, yet entertaining enough; if I hadn't just come from the Extreme Stunt Show, I might have been more impressed, but certainly not with the lame humor. I grabbed a Glaciers Cup (slushie) at Beverly Sunset Sweet Spells and a veggie cheeseburger and fries at Rosie's All American Cafe before catching The American Idol Experience Grand Finale Show, to watch, cheer and vote between 5 talented singers clamoring to win a special front-of-the-line pass for the popular TV series' real tryouts. 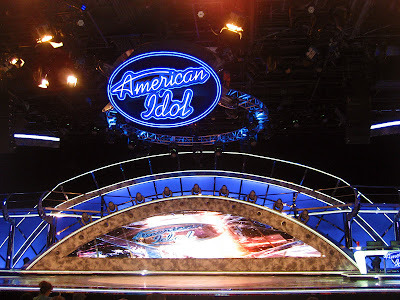 The attraction is complete with hair and make-up and a vocal coach, and in addition to the "live" audience and Ryan Seacrest Wannabe, the contestants perform in front of a panel of American Idol judges that mimic Simon, Randy and Paula - all on a sweet replica of the American Idol set. After they all had performed I helped determine the destiny of the singers onstage by voting as a member of the attraction audience on my individual interactive keypad - my favorite won, woo-hoo! Other than the absence of all the seats being full, it did feel as if really at the show and was a lot of fun. I ended the day with a bang as I claimed my seat in the Hollywood Hills Amphitheater, designed after the famous Hollywood Bowl and accommodating up to 10,000 people for Fantasmic!, a spectacular, 25-minute nighttime fireworks and water show extravaganza starring Mickey Mouse and a bevy of delightful Disney Characters, and featuring classic Disney music and songs, laser lights and amazing hydrotechnic effects. 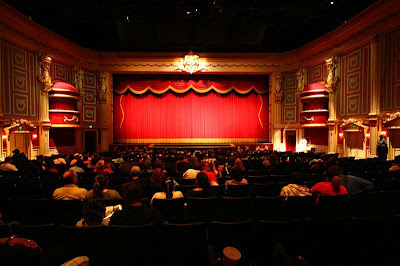 Because of its popularity, doors open 90 minutes before showtime for guests to start filling in; often the show is reduced to standing room only for last-minute spectators. I got there only 5 minutes beforehand, because I didn't sacrifice the American Idol show, and was just lucky enough to find a nice family with a little extra room for me on their bench. The show was awesome, definitely worth staying even after a long and tiring day.